Free UK delivery when you spend over £100! Drawing our inspiration from the magnificence that surrounds us here on the Isle of Skye, we have pleasure in introducing our elegant new range of seaweed infused, high quality, water based range of interior and exterior paints. Capturing our colours from nature’s playground, we feel sure that with 32 colours to choose from, you will find the right shade to fire up your imagination, bringing the very spirit of Skye into your life. At the head of Loch Brittle is a big beach. There is sand here at all states of the tide, and plenty of space for playing, kite flying and the like. The sand is not white, but that apart it is a beautiful spot with views to the Island of Canna. Please note: Whilst we try to replicate each colour on our website, colour on screen may vary due to a number of factors including screen resolution. We therefore advise that you order a colour card or sample pot to check actual finished colour. In Kilmuir Cemetery, just behind the Museum of Island Life, is a tall memorial to Flora MacDonald, 'Preserver of Prince Charles Edward Stuart'. Despite the romanticism of the Skye Boat Song et al, she was a real and remarkable person. This is the place to come to and spend a moment reflecting on her amazing courage. She was buried in this graveyard (though not very close to where her memorial stands) in 1790. The current name, Port Rìgh translates as 'king's port', possibly from a visit by King James V of Scotland in 1540. However this etymology has been contested, since James did not arrive in peaceful times. The older name appears to have been Port Ruighe(adh), meaning "slope harbour". Prior to the 16th century the settlement's name was Kiltaraglen ('the church of St. Talarican') from Gaelic Cill Targhlain. Battered by wind and rain this black rocked mystical isle has a history of Celts Clansmen and Crofters. The Cuillin Hills dominate a rugged primeval landscape where the weather and light change from minute to minute. The island was referred to by the Norse as Skuy (misty isle), Skýey or Skuyö (isle of cloud). Snow seldom lies at sea level and frosts are less frequent than on the mainland. Winds are a limiting factor for vegetation. South-westerlies are the most common In common with most islands of the west coast of Scotland, rainfall is generally high and the elevated Cuillin are wetter still giving rise to the name ‘The Misty Isle’. Dun Beag (the small fort) is the best known, the best preserved, and the most accessible broch on Skye. A short and easy walk up a slope of sheep-cropped grass takes you to the remains of the broch itself. It has massive walls, still mostly intact to more than 2m high. In them you can find lots of detail, including a gallery, the entranceway, a stairway and a security cell. 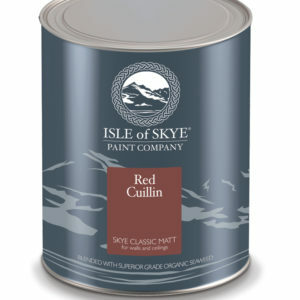 The Red Hills (Na Beanntan Dearga in Gaelic) are sometimes known as the Red Cuillin. They are mainly composed of granite which is paler than the gabbro (with a reddish tinge from some angles in some lights) and has weathered into more rounded hills with vegetation cover to summit level and long scree slopes on their flanks. The highest point of the hills is Glamaig, one of only two Corbetts on Skye (the other being Garbh-bheinn, part of the small group of gabbro outliers surrounding Blà Bheinn). Broadford, is the second-largest settlement on Skye. 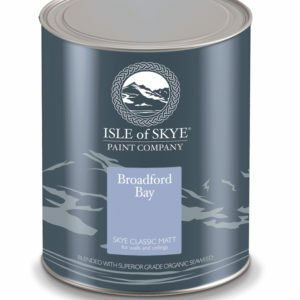 Like many places in Skye, Broadford derives its name from Old Norse. To the Norsemen this was Breiðafjorðr - the wide bay. The Gaelic name is of modern derivation and assumes that the "ford" element meant a river crossing. Broadford was a cattle market until 1812, when Telford built the road from Portree to Kyleakin. Veterans of the Napoleonic Wars settled during the first half of the 19th century. Writing in the middle of the 19th century, Alexander Smith said, "If Portree is the London of Skye, Broadford is its Manchester. Legend holds that the recipe for the liqueur Drambuie was given by Bonnie Prince Charlie to Clan MacKinnon who then passed it onto James Ross late 19th century. Ross ran the Broadford Inn (now the Broadford Hotel), where he developed and improved the recipe, initially for his friends and then later to patrons. Ross then began to sell it further afield and the name was registered as a trademark in 1893. The peaks of the Black Cuillin are mainly composed of gabbro, a very rough black igneous rock which provides a superb grip for mountaineers, and basalt, which can be very slippery when wet. The summits of the Cuillin are bare rock, jagged in outline and with steep cliffs and deep cut corries and gullies. Twelve Black Cuillin peaks are listed as Munros, though one of them, Blaven, is part of a group of outliers separated from the main ridge by Glen Sligachan. All Isle of Skye product photographic images kindly provided by Anton Rob Randle, Ian Cummings and Twilight Photography.